1. Combination Function keys: FN combined with a series of common shortcut key functions for easily typing. 2. Simple brightness control mode: Press FN+"["/ "]"to increase/decrease the brightness. 4 brightness levels in total. 3. Smart power saving mode: Backlit will turn off if no operation on keyboard for 3 minutes. 4. Built-in rechargeable battery: Its standby time is up to 80 hours. Its working time is up to 4 hours with backlit turns on . 5. Made by quality PBT Keycaps. 1). Full keyboard programmable: you can customize any keys to be another keys as you want. 2). Lighting effect customizable: static lighting brightness can customized and then saved on the keyboard, you can switch the lighting effect by pressing FN+\ . 3). Gaming Mode: Alt+Tab，Alt+F4 and Wins keys can set to disable to make sure they won't pop up when gaming. 4). Macro recording function: you can record combine few keys and then mapping on one key, after that, play the macro by pressing those mapping keys. 5）You can press FN + R_Shift to set the arrow keys as default or not. Note: Please upgrade the firmware before you stall the driver. ✦Compact and Portable: LTC - K61 is a compact mechanical keyboard with 61 keys, 60% layout keyboard. With a min size of 293*101*39 mm（11*4*1.5 inch）, which is super portable for you to take it everywhere with you. 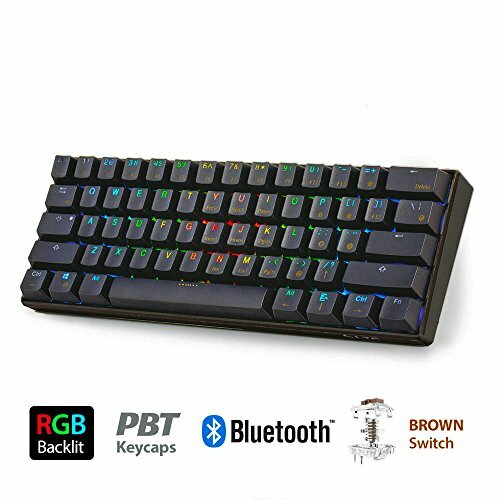 ✦17 Backlit Effects: Designed with selectable 17 backlit effects (8 single color and 9 multi-color), you never fell bored when using K61 RGB mechanical keyboard. ✦Programmable: After upgraded the firmware, LTC K61 is programmable that you can customize the keys/lightning effect and use the macro recording function to show your personality. ✦Multi-Device and Dual Connect Mode: LTC -K61 is compatible with most of the Bluetooth-enabled devices. It can connected with up to three devices and can easily switched among them. Besides, K61 supports both Bluetooth and USB wired connectivity, which fits you all kinds of using purpose. ✦Three Switches Selectable: [Red Switch]: It allows for more rapid actuation, which is suitable for gaming or typing quietly; [Blue Switch]: It is suitable for typing. (Blue switch is louder than other mechanical switches when typing); [Brown Switch]: It is a middle option between Black and Blue. It is ideal for typing in office environments. If you have any questions about this product by LEANINGTECH, contact us by completing and submitting the form below. If you are looking for a specif part number, please include it with your message.